Fortunately, UK students and their parents have many options when it comes to setting aside funds for future costs such as university. The government has specifically designed certain accounts, including Junior ISAs and, for certain children, Child Trust Funds, to help boost savings through tax incentives and investment potential. Before selecting the type of savings wrapper best fit for your future university-goer, it is helpful to know your options as a parent alongside the benefits and downsides of each type of savings. 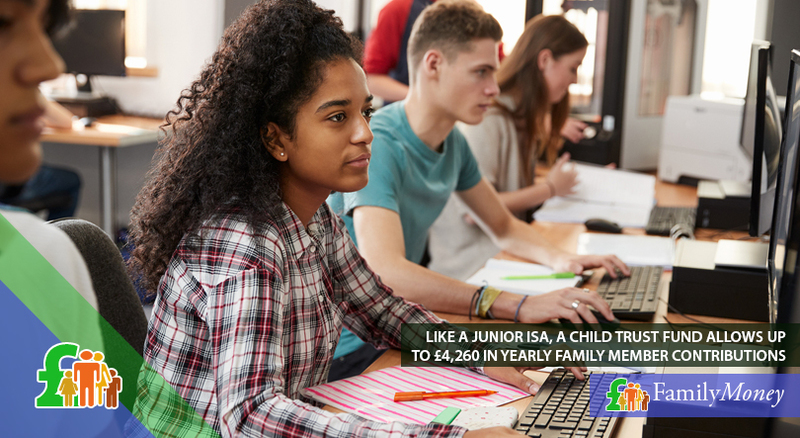 Officially launched in 2011, Junior ISAs are available to all children under the age of 18. This savings wrapper is a tax-free vehicle that allows parents to set aside money, either in a traditional savings with fixed interest or an investment scheme with a variable rate of return, up to the annual limits each year. For the 2018/19 tax year, Junior ISAs can be funded up to £4,260. Anyone family member can help contribute to a Junior ISA, and parents have the option to select a fixed-rate savings, or an investment account that provides access to the markets. Making the choice between the two is not always easy, but parents can use an ISA comparison site to help make an informed decision. Current rates for fixed-rate savings in Junior ISAs, as well as minimum initial deposits and monthly contributions, are all listed to help compare various options. Another way to keep children from taking on debt to help fund university costs is the Child Trust Fund. Like a Junior ISA, a CTF allows for up to £4,260 per year in contributions from family members, and these funds are transferred to the child when he or she turns 18. However, Child Trust Funds, unlike Junior ISAs, were automatically set up for qualified children if they were born 1 September 2002 and 2 January 2011. Any child born before or after that date range has the option to establish a Junior ISA, so long as they are still under the age of 18. If you are a parent with a Child Trust Fund, you do have the option to transfer it to a Junior ISA. One of the reasons for taking this step may be to gain more control over how the funds are earning, either in a fixed-rate account or an investment plan. Many financial institutions are weaning off their options for Child Trust Funds since they are no longer being opened. Parents also have the option to simply stay with the CTF until the child turns 18 as well. Whether money is going into a CTF or a Junior ISA, in an investment plan or a fixed-rate savings pot, setting aside funds to help a child prepare for the future is a must. The cost of university is continuing to rise, making it necessary to plan ahead so that debt is not the go-to solution. However, how much, exactly, do you need to set aside to cover this cost? Consider the following simple calculations. Parents saving the average £42.45 per month, per child, can amasse £9,936 by the time a child turns 18. Parents saving the average £42.45 per month, per child, can amasse £9,936 by the time a child turns 18. When interest of 2.5% is added into the mix each year, the same pot grows to £11,564 in that time frame. If savings increases to £340 each month, the 18-year total is more than £92,600 growing at the same interest rate. Savings in Junior ISAs or Child Trust Funds may be higher when investments generate higher returns year over year. Even putting aside a small amount each month makes a significant difference toward future costs. Parents – and their future university students – can put a dent in the growing cost of earning a degree when they think ahead. Using a Junior ISA, or a Child Trust Fund for those who qualified in the past, can be a beneficial way to grow tax-free funds while providing an opportunity to teach youngsters about the power of saving and investing.